(Chris Detrick | The Salt Lake Tribune) Real Salt Lake forward Brooks Lennon (27) celebrates with Real Salt Lake forward Joao Plata (10) after scoring a goal past Sporting Kansas City goalkeeper Andrew Dykstra (21) during the game at Rio Tinto Stadium Sunday, October 22, 2017. Real Salt Lake general manager Craig Waibel stood at the corner of the turf field and watched the disparate pieces of the front office’s vision converge. Of course there will be adjustments made to the roster moving forward, but for the first time in Waibel’s tenure, there’s no obvious thin spot on the roster. Over the past three transfer windows, the front office has strengthened RSL up the spine and on the wings. Now all that’s left to do is test the product against a field of MLS teams that have also gotten better, thanks to an increase in targeted allocation money. The first test for RSL will be Saturday’s season opener at FC Dallas. MLS made $2.8 million in discretionary TAM available for clubs in the 2018 and 2019 seasons, and clubs were allowed to dip into next year’s fund early, making this an exceptional spending year. Waibel and his staff strove to spend ”smart money,” and he told The Tribune that RSL owner Dell Loy Hansen made over half of this year’s extra discretionary TAM available to his front office to spend. The goal is to make playoffs. That’s the unspoken understanding among the players, according to defender Justen Glad. By all accounts, RSL heads into this MLS season stronger than it was last year. At midseason, the club acquired starting winger Jefferson Savarino and signed center back Marcelo Silva. This past offseason, Real Salt Lake added depth all along the back line, with an emphasis on right back as Tony Beltran recovers from a knee injury. The club also brought in two talented box-to-box midfielders, and acquired Savarino on a permanent basis. Under the leadership of coach Mike Petke, RSL is building off of a season in which it was one of the best teams in MLS during the second half of the season. This week he stood by that evaluation. With nearly a full season under Petke and his own detailed 2018 plan developed over the offseason, RSL dived into tactics right away during the preseason, further solidifying the coach’s mark on the team’s. In Tucson, they had days dedicated to defense and others to offense. In Orlando they tried to put it all together. RSL signed center midfielders Damir Kreilach and Pablo Ruiz in February, so the pair joined the team during the final preseason leg. Striker Alfredo Ortuño arrived during the first leg of preseason, but due to transfer complications between seasons that helped land him in Salt Lake, he’s working back from over six months devoid of competition. On Monday, RSL returned to Herriman for training, and Waibel looked on as every healthy RSL player whom he and his staff had signed in the offseason trained together in Utah for the first time. So far he said he sees their signings challenging the depth at their positions. Come Saturday he’ll begin to evaluate how that depth stands up to MLS opponents. At Toyota Stadium, Frisco, Texas. About Dallas FC • FC Dallas played two CONCACAF Champions League matches in the past two weeks, tying Tauro FC 3-3 in the aggregate series but losing the away goals tiebreaker. 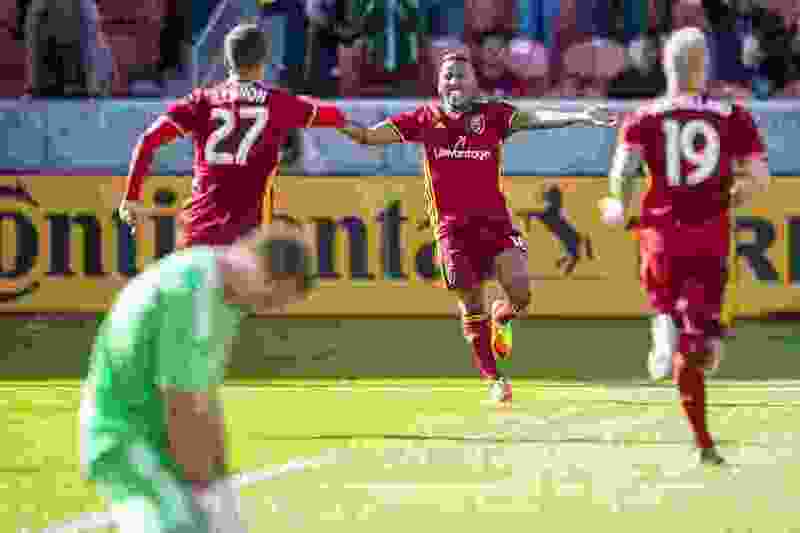 … In RSL’s last match against Dallas, Real Salt Lake became the first team in MLS history to concede five goals in the first half of a league match. … Midfielder Kellyn Acosta is expected to miss the match due to sports hernia surgery. About Real Salt Lake • RSL finished last year with an 8-3-4 record from July 4 through the end of the season. … This match against Dallas marks RSL’s first season opener with Mike Petke at the helm. … Tony Beltran and Jordan Allen are sidelined for the match due to knee injuries they suffered last season. … Defender Taylor Peay is out with a knee injury he suffered during the preseason.